HTC ONE is the future but s4 is sik still but HTC!!!!!! * BlinkFeed keeps you updated with the world glancing your home screen in a blink of an eye. * Intuitive, fresh and easy to use Sense 5 to make your phone look stylish, young and professional. One thing definitely is for sure, I would pick any of these lovely phones over the Samsung Galaxy S4. I have yet to notice any lag on Sense5. Sense (5) features are intuitive and logical. BlinkFeed is very useful and has a great future. Camera bests the competition in almost every way. Screen has natural colors and superb viewing angles. The body is metal and ergonomic for a great feel. Do I even neet do mention stereo front speakers? And a 2.1MP super wide-angle HDR front facing camera? feres13, 06 Apr 2013The Z in my opinion can't beat the One : Design :the Z just misses that a device this big nee... moreYou are annoying, you don't even have a HTC One to test if it is good for you or not. And Blinkfeed yeah boring, and can't even turned off, sense is heavy and laggy. HTC had quad core phones in 2012 and still laggy, even Tegra 3 was not capable to handle the sense UI. But with Sony the chipset is performing outstanding and smooth and CAN handle the UI with no lag. Sony just need to update the camera software, and with the Exmore RS technology is will be better than HTC's camera. And sound comparison is quite unfair because the sony doesn't have top and bottom made with just soundbar for loud sound, They have NFC one touch technology for using portable speakers for even better sound so easy! Viewing angles are crap, I sue my phone on the dockstation, car, table etc.. no problem! 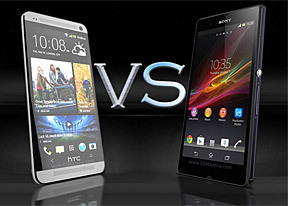 Both are good phones but HTC can't even ship those One's I think the Galaxy S4 will beat it anyway again. Here is what the Xperia Z got for awards and prices, get your facts straight. Sony xperia Z is a good phone with apps you are going to use and nice camera, video, and screen not bloated like the HTC One and blinkfeed you can't turn off, the laggy sense UI offcourse it needs the Snapdragon 600. The Xperia UI is perfect with the S4 Pro and smooth. The real difference will be the Snapdragon 800 with adreno 330 gpu. Maybe end this year or 2014 then I will replace my Xperia z with another Sony phone, hope so. Beautiful design, premium, and water resistant ;-) eat that HTC one fans. AnonD-106548, 18 Apr 2013You will care if you are having bad connectivity in the areas you are in.... Nothing beats the... moreI said nothing about cloud storage. I stated 32/64GB is plenty enough. And if If I want to watch a bunch of films when traveling or something I'm gonna pack a USB stick with me and won't store the movies on the phone as it fully supports USB OTG. Phone storage is for music and vids and photos (that don't take up much space because the 4MP SIZE anyway. Cloud storage wise, I don't know about you but I've got Wi-Fi at home, work, pubs, libraries, train stations and they're even testing to have it on public transports during transit. Just to add, our biggest carrier just unveiled 4G LTE across the country and the coverage is quite good.